SHADE | What Does SHADE Mean? SHADE means "Disrespectful". The term SHADE is typically accompanied with the verb "to throw". 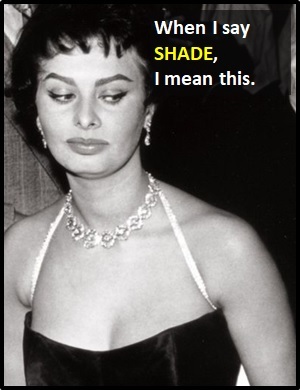 Someone that "throws shade" is publicly criticizing or expressing contempt for another person. Until recently, the word SHADE was mainly used in the gay community and in drag queen culture. However, in recent years it has become much more mainstream. The first known use of SHADE was in the documentary film "Paris Is Burning" (1990), which is based on the Manhattan drag scene in the 1980s. Person A: Did you watch RuPaul's Drag Race last night? Person B: Of course! Did you see the SHADE the contestants were throwing? Person A: Girl, you call yourself legendary? More like leg and dairy! Person B: Why are you throwing SHADE? Terry was throwing serious SHADE at Lola last night.